These 18oz. Diamond Balloon Wine Glasses feature a unique, diamond-shaped balloon bowl , this glass combines simplicity and style to add an upscale flair. The wide bowl provides plenty of room for air circulation to fully release the wine's flavor profile, enhancing its rich flavors and allowing them to emerge for a more fulfilling experience. 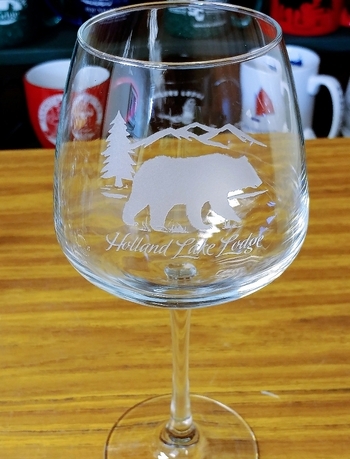 Each glass (approximately 8" in height) is sand carved (etched) by hand with the Bear and Mountain Silhouette artwork and Name Drop.